Tasha flew in early Friday morning for our annual weekend at the Beale Street Music Festival. We have gone every year since 2003, except for last year’s tornado incident where we spent a lot of time in the closet. I picked Tasha up at the airport Friday, and we were at Harrah’s Casino in Tunica by 9am. We played the slots until Paula Deen’s buffet started serving lunch, which was our real reason for beging there. We gorged ourselves on all of Paula’s magnificent creations – macaroni and cheese, sweet tea, biscuits, green beans, mashed potatoes. So fantastic! We came back to my house and relaxed for a few hours before heading downtown for MusicFest. We had dinner at Majestic Grille on Main Street and then strolled in and out of the art galleries on South Main for Trolley Night. We didn’t buy anything, but had a nice walk to work off all the food we had eaten that day. We got into the Beale Street Music Festival around 7pm. I went straight to the hat tent because I wanted to get a new cowboy hat. The prices were much lower than when I bought one a few years ago, so I bought another one. 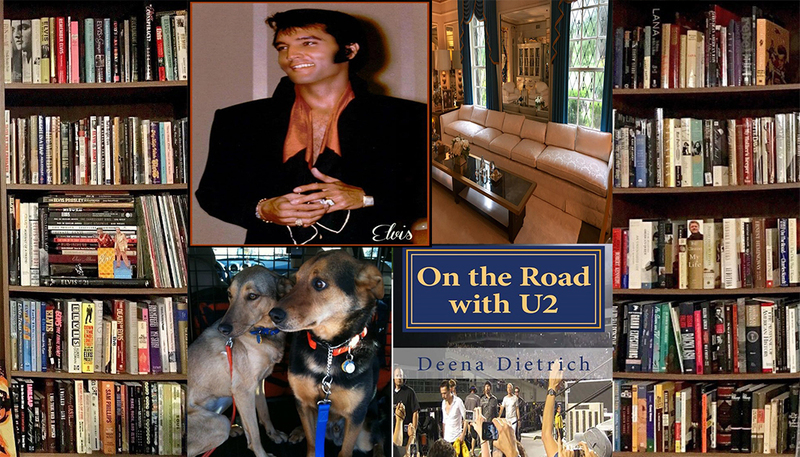 I may be wearing it a lot this summer while I’m On the Road with U2. Tasha wanted to see both Everclear and Cake, but they were playing at the same time. I didn’t like either, so I didn’t care who we saw. She decided to see Everclear, and I was so glad. They were good. 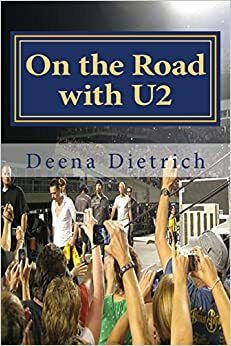 I had issues with them because I had met the lead singer years ago in a bar in Baltimore I used to hang out in and he wasn’t the coolest guy. But I did enjoy Everclear’s set, although they played the songs a bit slower and his voice was a little lower than I remember. After Everclear, we were walking toward the stage of the next band we wanted to see when we heard Cake’s last two songs – which were also their most famous. So Tasha got to hear both bands. 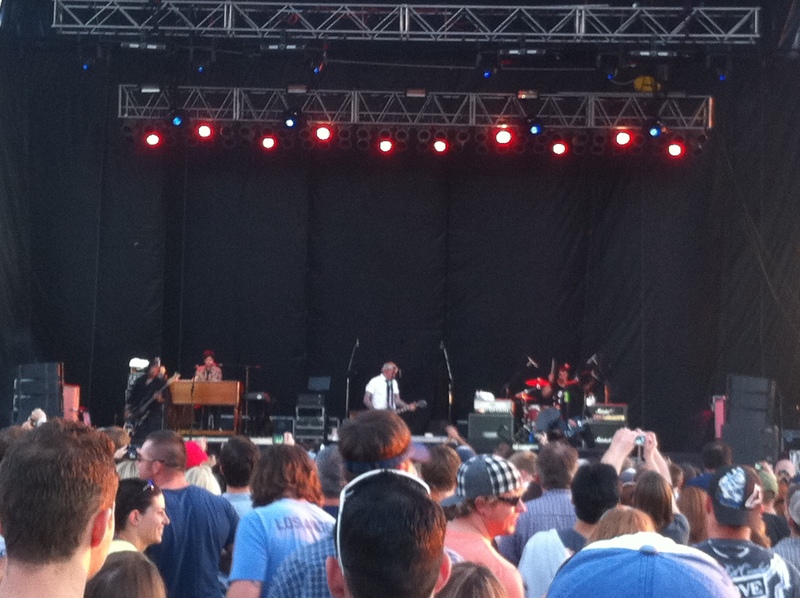 I am really glad we were at Everclear’s set because I actually enjoyed it, and I was right about Cake – I don’t like them. We both really wanted to see Flaming Lips because everyone had said they are a great live band. There was a huge crowd waiting and the anticipation sure did not match the performance. They are visually pleasing, but not musically. Not my thing – maybe because I wasn’t high. 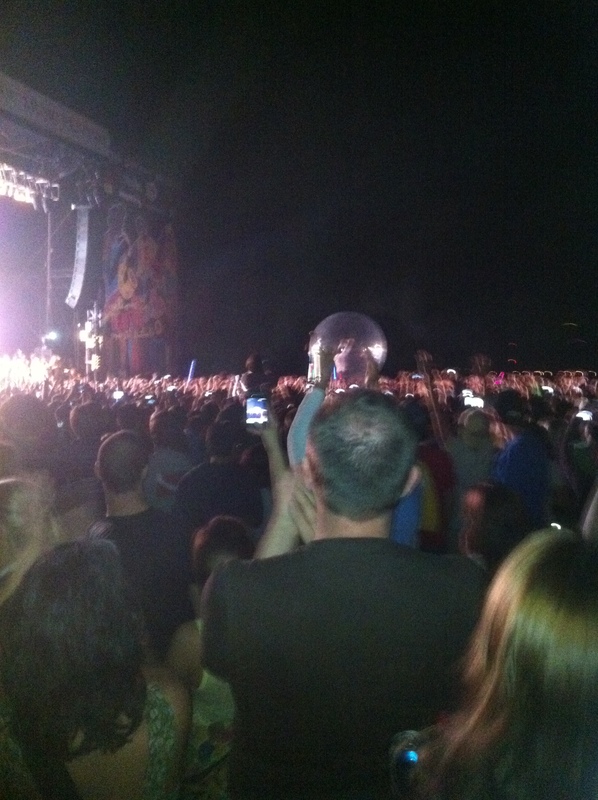 The lead singer got in a bubble and rolled on top of the audience and then balloons and confetti were launched into the crowd. Visually exciting, but not musically. We left after the first song. Tasha loves Stevie Ray Vaughan, so she wanted to see his brother Jimmy Vaughan play. Off to the Blues Tent we went – couldn’t get away from Flaming Lips fast enough. 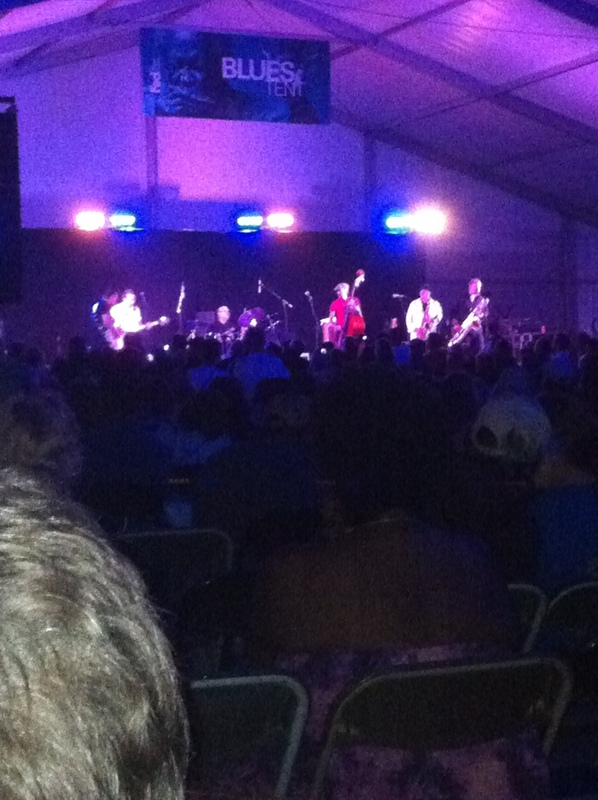 Jimmy Vaughan was great. He was more than just blues – he was sort of rockabilly as well. And I love rockabilly! They even had a sax in the band. More bands should really play the saxaphone. I love the sax! We were really tired as it was closing in on midnight, so we only stayed for a few songs. On our way out of the festival we heard a couple songs by Stone Temple Pilots. I originally wanted to hear their entire set, but was just too tired. So we just listened as we walked by. 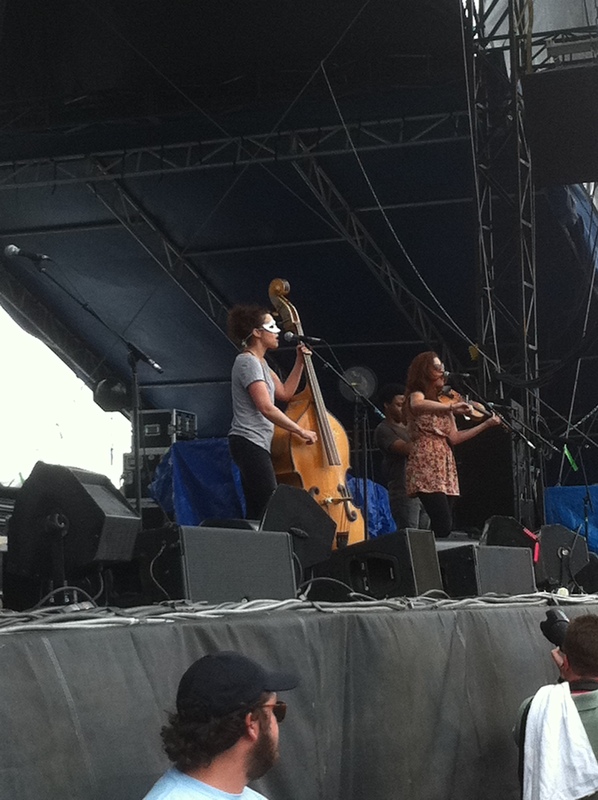 I did get to hear two of my favorites by them though. Saturday Tasha and I decided to go downtown early and have breakfast at the Arcade diner. When we got there, they were lined up around the corner. So we decided to go to Beale Street to see what was open. It was around 10:30am. We parked on the street for free and went to Lil’ Anthony’s because I had heard they had good breakfasts. They don’t. I don’t know if they were just having a bad day, but it was terrible – the service and the food. We ordered sweet tea, and got regular tea. Our waitress apologized and said she would get us sweet tea. She then told us they had to make it, and then told us they had to find the sugar – we never got our sweet tea. Our order came out and mine was wrong and Tasha only got half of her’s. We didn’t have silverware, but we did get that. Tasha ate the food she was brought, and I still didn’t have mine. I cancelled my order and the rest of Tasha’s, and we left. We walked down Beale to Alfred’s, and by this time is was about 11:45, so we had lunch. I love Alfred’s – best food on Beale! Don’t ever go to Lil’ Anthony’s, go to Alfred’s! After walking around Beale Street for a bit, we went to MusicFest around 2pm. 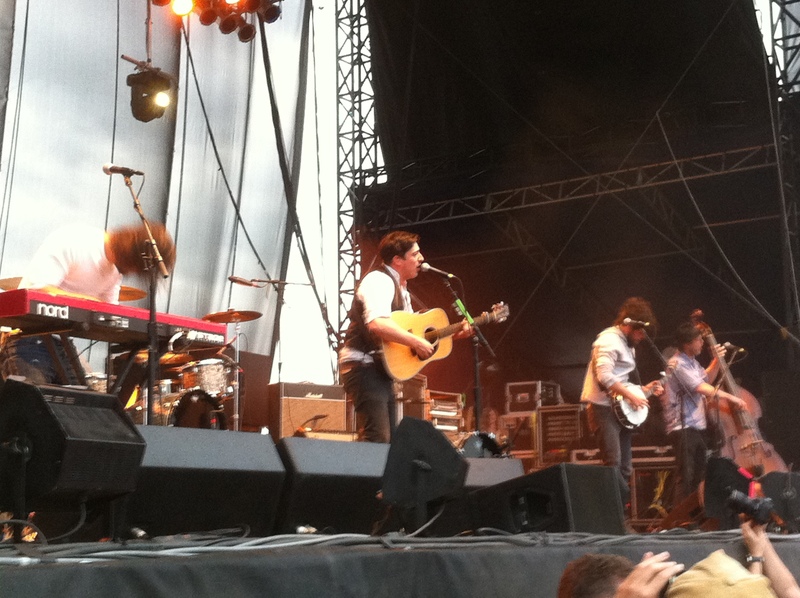 Tasha’s main purpose of Saturday was to see one of her favorite bands Mumford and Sons. Luckily everyone I wanted to see Saturday were on the same stage as Mumford and Sons, so we secured our spot at the front rail and camped out at the Budweiser Stage all day. Amy Lavere was up first. I had seen her once before and she was great. She was great Saturday also. Tasha really liked her too – and even bought her cds the next day. Amy has a very unique, passionate voice and plays the stand up bass – and she lives in Memphis! We had not heard of Paul Thorn, but he was up next. His drummer looked like he was right out of the 50s with his sideburns, rolled up sleeves, and Elvis tee shirt – he is even from Tupelo. 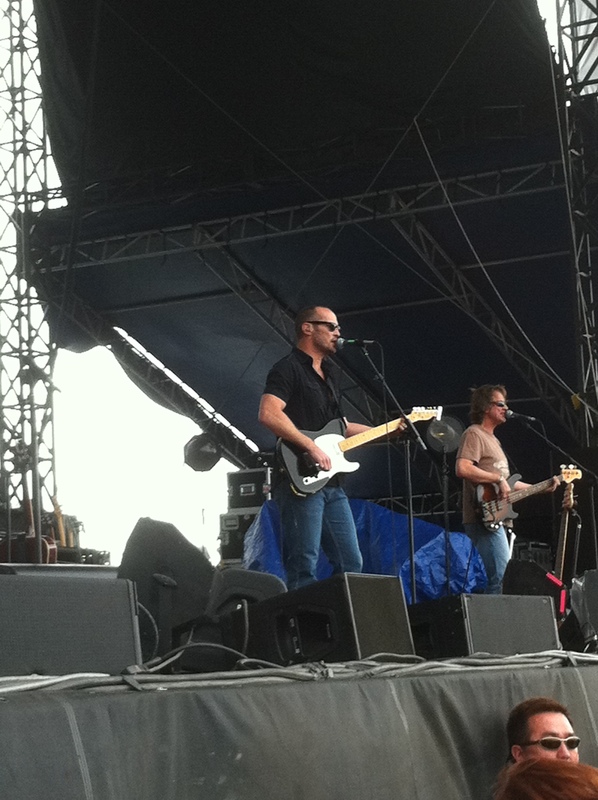 I also found Paul Thorn very attractive with kind of a raspy country Ryan Bingham sort of voice. I may get his cd. The Killer, Jerry Lee Lewis, was next. 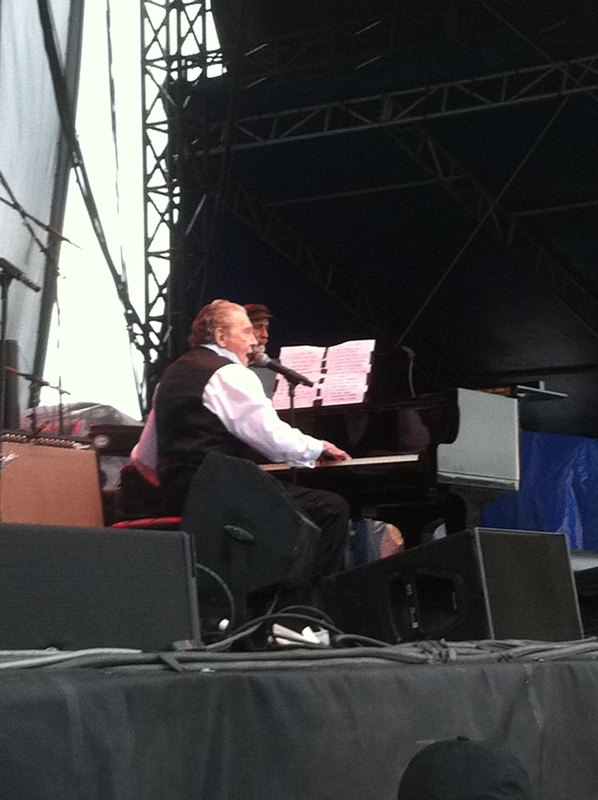 This was the 8th time we have seen Jerry Lee Lewis, and the 8th time we’ve seen Elvis’ friend George Klein introduce him. 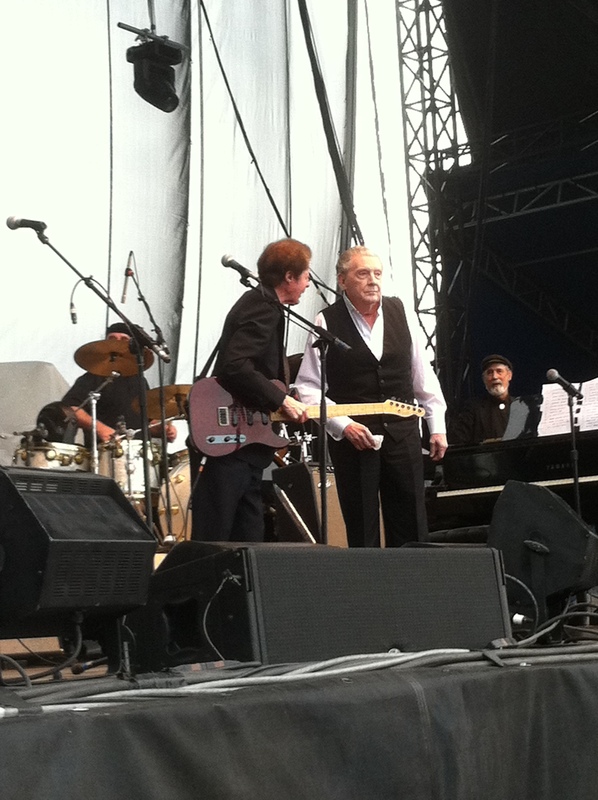 Jerry Lee performs every year at the Beale Street Music Festival, and he never disappoints. He is 75 years old and as ornery as ever. And he can still play that piano! He is one of my favorite artists. He is the last of the original rock and rollers, the last of the Sun Studio stars, the last man standing. Although Tasha was really excited to see Mumford and Sons, I was not. I had seen them on the Grammy’s, and they just aren’t for me. But I stayed there, even though the crowd was jumping and freaking out. I liked every song that the banjo was not played. I’m still not a fan and wouldn’t buy their cd, but they are very talented and passionate – it’s just not my thing. Tasha loved them and was even more excited when she saw Jake Gyllenhall watching from the side. After Mumford and Sons, we were exhausted so we left the festival and went to Central BBQ for dinner. It was fantastic! We sat out on the deck. It was Tasha’s first time there, and she thought it was the best bbq she’s had in Memphis. I love their BBQ portabella sandwich! After we went to the new YoLo’s for dessert. I had their amazing death by chocolate cupcake with icing like parfait. Sunday we decided not to go to the Beale Street Music Festival because it was pouring rain. We went to the Cupboard for lunch. We have been going there for years. We stumbled upon it back in 2002 when we visited Memphis. I love their eggplant casserole, and Tasha loves their catfish. 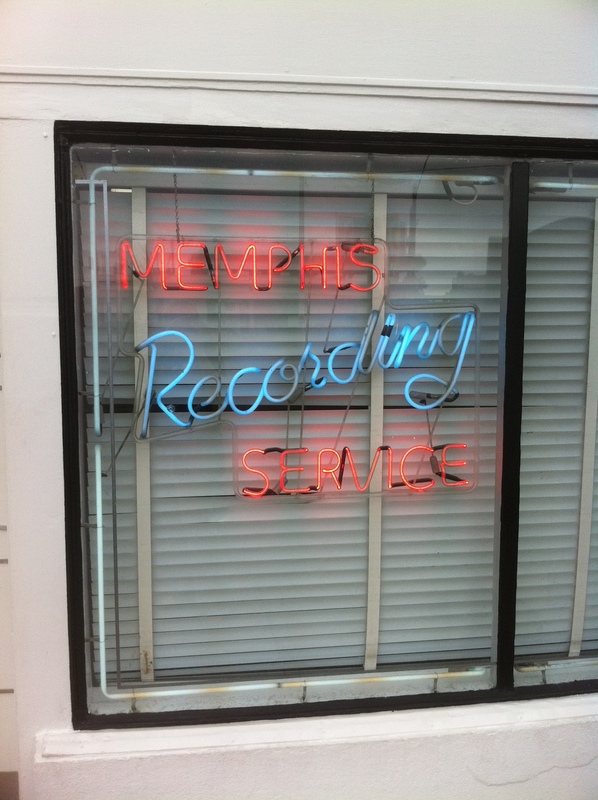 We then went to Sun Studio. We didn’t take the tour, as we could give the tour by now. We just sat in a booth and hung out for a bit, soaking in all the music history. After Sun, we went to see Water for Elephants. Tasha had read the book and really wanted to see it. Although I liked that it was set in the 1930s and starred Reese Witherspoon, I was little scared to see it because of the animal abuse. And I was right. I cried through a few scenes. It was an ok movie, a little slow for me, but Tasha liked it. After the movie, we walked out to discover a tornado was heading for midtown. We stayed in the lobby and watched the news for a bit and then decided it was safe enough to go home. By this time, I had developed a terrible migraine and took a little nap on the couch. After a couple of hours, we went to Bosco’s for dinner. Yummy humus andveggie burger for me! Tasha wanted gellato, so we went back to YoLo’s. Although my migraine had subsided, I wasn’t totally 100% so we just went back to my house and watched Up, which was really good. Monday morning we woke up to no power – again! It had gone off during the night for a few hours, came back on and then went back off again. It came on just after 9am and luckily stayed on. We drove out east in the pouring rain to Blue Plate for breakfast – our favorite breakfast spot. They have the best biscuits! We then went to Flashback, which is a cool store on Central that has 1950s and 1960s clothes, furniture, decor, etc. I love it there! I bought a silver Johnny Cash cigarette case, even though I don’t smoke. I may use it as a wallet. Tasha bought a cool silver, peace sign painted belt buckle and belt. We went back to my house for a bit before I took Tasha to the airport for her flight back to Pittsburgh. I spent the rest of the cold rainy day on the couch catching up on my dvr and eating our leftovers from the weekend. Nice review. Flaming Lips are fun – I don’t know their music either but I enjoy the spectacle. Of course I love Jerry Lee. Paul Thorn sounds interesting, I’ll have to look him up. No we didn’t see Ke$ha perform, but we saw her as she walked in front of us to watch some of Jerry Lee’s set. Thanks for reading. Hopefully see you at Lollapalooza.